Miss Mia is quite the girl! She came to life in my studio, with warm, green eyes & dark, brown hair. She loves to wear a pretty dress, but then decides she really must climb a tree while wearing said dress. Oh, it's never boring around here. Mia has been in her new home for a few weeks now. I've heard she may have a children's book written about her. That's exciting, huh? Mia will definitely make her mark on the world when that happens. I'll keep ya posted on that bit of news. 1. M y favorite colour is blue most of the time, but sometimes purple. 2. I love dogs, but I don’t like it when they need a bath. 3. I don’t want to grow up. 4. Since I have to be a grown up someday, I wanna be an artist, though. 5. I don’t like my name, Margaret Elspeth – ugh! I liked to be called Maisie. I was named after my 2 grandmothers. 6. One time, my tongue got stuck on a cold pole. It hurt really bad & I’m never doing a dare again. 7. I don’t like pudding, but I love chocolate cake. 8. I once had a pet fish, but he died and I was sad. He would eat his food from my fingers. He was very smart, but most people don’t believe it. 9. I love Christmas. I love to get things in my stocking and I love to make pretty things for people like my Mom and stuff. 10. I’m scared of the dark, kind of. I hide under my covers and it makes me feel safe. Oh Anne of Green Gables, how I love you! I have adored you most of my life, I think. The Anne books written by L.M. Montgomery are some of the books I hold most dear. Anne Shirley is a “real” girl, full of “real” thoughts & with a bright personality, that never forgets the sadness of life, just chooses to see the best in everything…at least most of the time. She makes me wish I could be her bosom friend too, just like Diana Barry. She makes her large share of mistakes daily. Boy, can I relate to that, both when I was a child & especially now as adult!! However, one of my favorite lines in the book is when Miss Stacy, Anne’s favorite teacher & mentor encourages Anne, saying “Tomorrow is always fresh with no mistakes in it…well with no mistakes in it yet.” Ahh, yes…tis true & I am so thankful, aren’t you? [A quick aside – the ‘80’s Canadian movie production of Anne of Green Gables with Megan Follows is truly exceptional. If you haven’t seen it, do it now!] http://indiecart.com/WithLoveHannah/mt/105/94743/Anne-Girl—Anne-of-Green-Gables-by-With-Love–Hannah Anne wears a nice, serviceable dress, deemed so by her adoptive mother, Marilla. Which translates to not too frilly or wasteful of fabric, I believe. It’s a light greyish blue with tiny brown flowers in pure cotton. Her pinafore & pantalettes are tea dyed, organic cotton batiste. There’s a pocket on the pinafore, (quite utilitarian) with an embroidered blue heart on it. Anne practiced a bit of embroidery there. Her shoes are lace up boots, dark brown, handmade wool felt with leather soles. Again, a vital part of her wardrobe that’s very utilitarian for her long walks near The Lake of Shining Waters or through The Haunted Wood. She also wears a straw hat, trimmed with brown ribbon, also an important accessory while jaunting about. Every stitch of clothing, except her hat, is made by me & I put lots of love in every stitch. 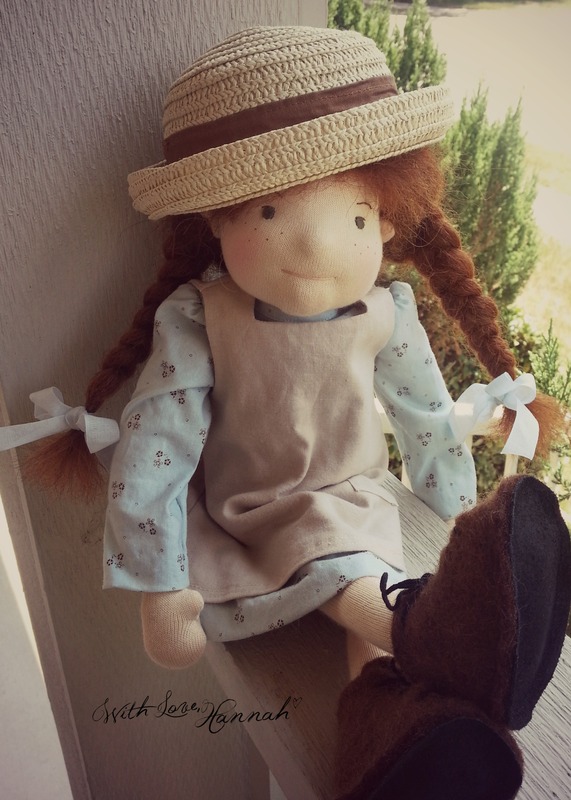 As with all my dolls, Anne is crafted with great care. She measures 15in/38cm. She is stuffed with wool and is the first doll I made using a Swiss doll skin fabric, Laib Yala, in the fairest color. This fabric handles quite differently and therefore Anne has a few quirks (don’t we all?) usually not found in my dolls. Her legs lie at a slight angle and are a tad less firm than usual. Also, Anne was honored to attend a special luncheon in July. It was especially for cloth doll collectors. She was on display & oh the stories she can tell. When she returned home, she had a slight grey smudge on her right hand. I have cleaned it as well I can, but it can still be faintly seen. Be sure to see the pictures for details. I weighted her body lightly with fine glass beads enclosed in well-sewn sack. Anne’s face embroidered with cotton thread and her freckles are permanently applied with sepia ink. Her hair is braided with pure cotton blue ribbons tied at the ends. It is a natural camel weft, which I dyed a dark red, not quite as bright as carrots. It has natural highlights from the varied, untreated color of the camel fiber. I think she’s growing into a nice auburn already, which Anne seems to appreciate. Her hair can be gently brushed & styled.